Already a member? Renew Now! Join us at AAPT in our mission to enhance the understanding and appreciation of physics through teaching. Apply for membership using this convenient application form. You will need an AAPT web account and a major credit card. If you don't have an account, create one from the link below. Once you join or renew, it may take up to 48 hours to update your membership status. or contact membership@aapt.org for help. Being an AAPT member brings with it many benefits in addition to supporting the association's projects and programs. Explore the benefits below (by clicking on the headers/arrows). Your membership includes online access to The American Journal of Physics, The Physics Teacher, and Physics Today as well as the email newsletter, eNNOUNCER. AAPT membership also provides online access to everything ever published in the American Journal of Physics and The Physics Teacher, a total of more than 15,000 papers. You have the option of receiving print copies of all three journals for an additional fee. Online access is through Scitation and requires registration and a separate login from your AAPT membership. New members receive an email from Scitation with registration information. If you need assistance with your online journal access contact the Scitation help desk at help@scitation.org. If you have included print copies of the journals, they will arrive in your mailbox 4-6 weeks after you join. Additional postage is required to mail journals to addresses outside of North America. Sign up to receive Table of Contents Alerts (TOC) for The Physics Teacher (TPT) and American Journal of Physics (AJP). This benefit allows subscribers to be notified by email when a new issue of either TPT or AJP is posted online. The email includes a text version of the table of contents of the journals. To take advantage of this benefit, go to the AJP TOC Email alerts sign up and enter your email address. Be the first to know about new journal articles of interest to you! All members are encouraged to participate in Committees and Advisory Boards. Further networking opportunities include email discussion lists, Department Chair Conference, PTRA, New Faculty Workshop, the online membership directory, local section activities, and AAPT's online publication The Physics Educator. Physics Education Research professionals can join the PER Topical Group for $40 per year (Student dues $15) when they join AAPT or renew their membership. The AAPT Speakers Bureau offers members a list of qualified physics education professions who have volunteered to speak on various topics. Members can search the list to find a speaker for a local event. They can also sign up to participate as a speaker. Enjoy a member discount on books, videos, t-shirts, toys, and many other physics related products in our Physics Store Catalog. In addition, members are eligible for discounts on publications from other American Institute of Physics member societies. You may also download the electronic version of the paper catalog. As a feature of membership, we are pleased to offer all AAPT members a 30% discount on all MIT Press physics and mathematics titles. If you are already an AAPT member, access the Members Only Discount Code and start shopping today! Please refer to this page periodically, as the code will change on a regular basis. Not a member yet? No problem! Click here to join AAPT today and take advantage of this special offer in addition to all of the other features of membership. Members receive special pricing on registration and workshop fees at all AAPT national meetings. This is a unique opportunity to take part in a variety of events that are based on physics education and the principles that AAPT represents. Enjoy a variety of sessions and activities including internationally known physics speakers, committee meetings, awards, workshops on various facets of physics teaching, presentations, poster sessions, and most of all, over 1,000 physics teachers. AAPT also hosts a broad range of physics equipment suppliers, resources, and booksellers in our large exhibit hall. Advance your career with AAPT's Career Center, you can post job openings, and sign up for face-to-face interviews at our Annual Winter Meeting. Members receive competitive rates on life, disability, and long term care insurance. Read more about APSIT group insurance discounts. AAPT offers you membership opportunities at a level that best serves your professional or academic needs. 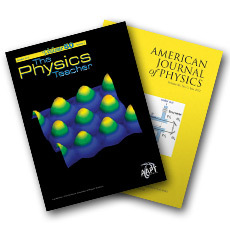 Regular, Retired and Emeritus members have a choice of print subscriptions to either one or both of our acclaimed publications, the American Journal of Physics (AJP) and The Physics Teacher (TPT). All members* automatically receive electronic editions of the journals with full text access. Print and online subscriptions to Physics Today are included with your membership. Student members receive electronic subscriptions only. International members have the option of membership with electronic subscriptions only. Note: memberships are non-transferable and all journals are strictly for individual use only. Commercial distribution is prohibited and can result in forfeiture of member benefits and privileges. *Life Membership includes the benefits available at the time of purchase. Online access was not available prior to 2008 but can be added at any time upon payment of the additional fees. 1Members in countries other than the USA will be charged postage for print copies. 2List of Least Developed Nations (as determined by the Fuller Fund Committee). Once you're ready to join, please proceed to the registration page. Corporations and institutions that wish to promote physics and receive discounts on meeting exhibits and advertising are welcomed as sustaining members. Learn more about Sustaining Member Benefits! Once you're ready to join, please call the Member Services team at 301-209-3333 or email us at membership@aapt.org to schedule a convenient time for us to call you. All individuals, who want lifelong member benefits at today’s membership rates, are eligible. For further information, including the different options available, please contact member services at membership@aapt.org or by phone at 301-209-3333.